Paul Schmitz created Artifact, one of Doomworld’s picks for the top 10 WADs of 1995. 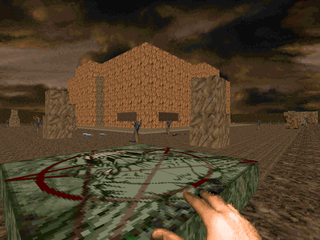 He also contributed some maps to Eternal Doom, very much in keeping with his mapping style. 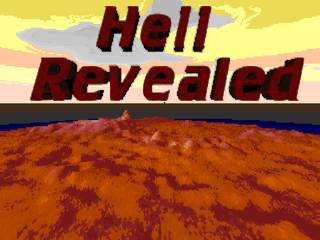 Welcome to Hell, his lesser-known followup to his premiere trilogy, is something in a bit of a different direction, finished near the end of '95 but released in early '96. It’s not exactly one large map cut up into three linked adventures. Each of the levels is fairly small and / or short compared to the offerings of Artifact. Schmitz has refined his map making sensibilities, however, creating a number of challenges with a unique aesthetic sense. Dawn of the Dead is an episode replacement for Doom's Knee Deep in the Dead. Well, almost an episode replacement. 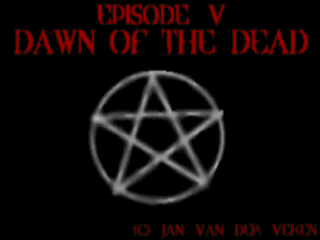 Jan Van der Veken never finished E1M5 (at least, for this episode), so it's more like 8 maps. The story takes place on Jupiter's moon, Europa, where simple lifeforms were discovered, leading to attempts to terraform the planet (I mean, that would probably kill all the native species, but whatever). The end goal was to colonize the moon, and at the "current" time, there's a burgeoning population complete with a contingent of space marines. Of course, they managed to discover relics from a past civilization that mastered teleportation technology (sploops!) and, later, some manuscripts containing vague warnings (double sploops!). And, now, the moon's colonies have (mostly) overrun by an unknown hostile force. Owing to your expertise, you're sent in to deal with the situation. Oh, hey! Eriance's evil twin updated a few days ago, mostly to say that he's slowly chipping away at his magnum opus (and talking about Rage, which I love). DoomX and Demon Eclipse are my two watched Mordeth-esque projects, and coincidentally, Eriance recently pushed out a new beta of his pet project as well. It's a great time to be playing Doom, especially with all the user projects going on, like Doom Core, Reverie, Back to Saturn X, Community Chest 4, Doom the Way id Did, 1994 Community Tune-Up Project, Plutonia Revisited, TNT2: Devilution, Doom Unleashed, Progressive Fiction, Interception, and that's just the megaWADs I can name off the top of my head, not to forget the wonderful work of Paul DeBruyne, or Kaiser pushing out Doom64Ex (already garnering some user-made maps). Actually, there's just new stuff being made every day for Doom. It's one of the greatest gaming communities to buy into. 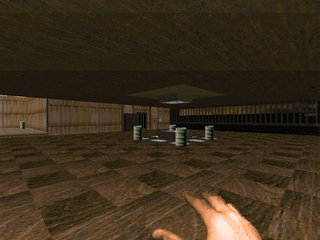 If Sverre Kvernmo is known for anything, it would be his body of works included in id's Master Levels for Doom II. Less people may know that these works were parts of a work-in-progress megaWAD entitled "The Cabal", which Kvernmo stopped developing when contracted by id. Ever the gentleman, he gathered up the remaining maps and released them to the archives as Cabal 1-7. Together with his four (er, five) Master Levels, they represent one third of his unfinished magnum opus. Though part of me wonders what might have happened if Kvernmo had completed his project, I recognize enough of a quality gap between the freely available maps and his contracted work that I'm grateful for the intervention. I'm sure the experience coupled with his natural talent created the base upon which he built his three astounding Eternal Doom entries. "...some people never bother to use skill level selections, and always play on Ultra-Violence. These people see that Hell Revealed is too hard for them on Ultra-Violence but instead of playing on skill 3 or even lower, they just say 'Hell Revealed is too hard' and switch to godmode or don't play at all. To me it seems really stupid - after all, that's what difficulty levels are for!" The Image of Evil is the final map in Sverre Kvernmo's Cabal series. It's a MAP30 replacement, serving as the intended climax of the now defunct megaWAD. The map represents a temple in tribute to a demon, the first to slay an angel in Cabal's universe, named Lithlaar. It also houses the current Cyberdemon that rules Hell, as well as his two soulguards (two other Cyberdemons, I believe). The map features a variety of textures, tending toward a more earthy / wooden theme with some excursions. If you didn't already know it by now, the level's structure is in the shape of a classic, slightly comic devil. You know, the kind that has horns, a goatee and red tights. In Kvernmo's own words, "Cowards go IDBEHOLDA as soon as they enter. Good players will see it evolve." Of course, if you find the automap secret fairly early on, the image autocompletes. Still, it's fascinating to see the map unfold. 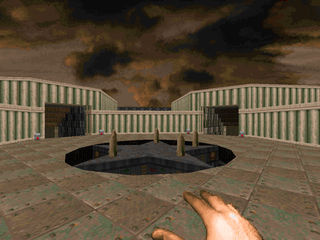 Black Tower is the final map of the Cabal series to be included in id's Master Levels for Doom II. In the storyline, you're nearing the end of your long journey, this time confronting the lord of the Black Tower, former friend and Cyberdemon Chagrin, who leads the forces of Hell you once commanded. All you have to do is climb the Tower, the nexus of all of Hell's black magic and supernatural forces, slay your buddy, and escape. It's a task easier said than done, of course, as the Black Tower is more fully staffed than any entrenchment of the Cabal to date (except maybe the Temple of Death). 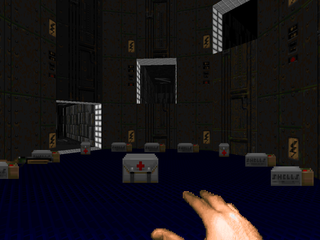 Mephisto's Maosoleum is another MAP07 replacement for id's Master Levels for Doom II by Sverre Andre Kvernmo. However, where the previous map (Bloodsea Keep) made no specific use of tag 666, this map (like "Dead Simple") is based around it. In the context of the Cabal series, the player (the previous ruler of Hell, ousted by his own advisers) wanders across the tomb of his old mentor, Mephisto, the head of the Cabal prior to the main character. Apparently, though Mephisto had been ousted and slain, his spirit still sat on the council, and he was in on your betrayal. Accordingly, when you happen upon his grave, you decide to exact revenge by laying both body and mind to rest. Over the past few months you'll have noticed my focus on id's Master Levels for Doom II, consisting of 20 individual PWADs by six different authors. The maps enjoy a wide variety of difficulty and size as well as aesthetics as befits such a collection. I was preparing to write a full retrospective highlighting the package itself to flesh out its current page under the Features section of the blog, which intended to answer the question of whether these maps are worth your cold hard cash. And, uh, that's a tough question to answer. The package isn't available as an individual purchase on Steam, and in the two packs it's included in (the Doom Pack Complete and the id Super Pack) it's separately listed at $69.99 and $34.99, respectively, before package discounts. I don't know the reality of the situation, only the appearance. That said, under current conditions I wouldn't recommend buying the Master Levels for Doom II. Even if you ignore the suspicious pricing, it's only available as part of a package deal. If you don't have any (or most) of the included games already, then yeah, go for it. The difference assuming reasonable pricing is a 50% deal as opposed to a 75% one, at least for the Doom Pack. The Express Elevator to Hell is perhaps the most notorious map contained within id's Master Levels for Doom II, if not for its difficulty then for containing the only secret map which Kvernmo apparently snuck under the radar, judging by Shawn Green's comments. TEETH.WAD replaces MAP31 and 32; 31, of course, is the main event, the elevator ride. MAP32 is "Bad Dream", a fairly well-documented secret map that will be covered at the end of this review. The story so far: The Cabal has realized that you're a force to be reckoned with, human or not, and elects to ambush you on your elevator ride to the deepest pits of Hell. 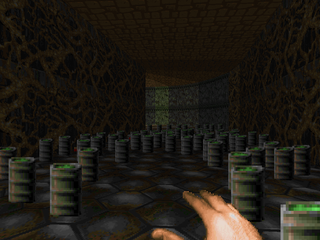 Sverre Kvernmo was a late addition to id's Master Levels for Doom II project. He sought out id and sent them a batch of maps for admission, and after one of the designers (still unknown) was let go, Kvernmo was in. All of his submissions came from a megaWAD he had in development, entitled The Cabal. The plot is simple. You were once the biggest and baddest Cyberdemon, the ruler of the Cabal, the organization that governed the underworld. They turned on you, though, ousting and dismantling you, finally transforming you into a human. 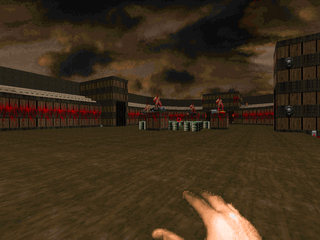 In Bloodsea Keep, a MAP07 replacement for Doom II, you emerge from the sea into which you were cast, intent on exacting revenge on your treacherous brethren, beginning with the arch-vile, Veavitdpoh, who just so happens to rule the Keep. Eye of the Storm is Sverre Kvernmo's sixth map in his freely released Cabal series, a replacement for MAP09. The storyline places you in the middle of the ruins of the cacodemon empire, which collapsed 665 years ago. You don't anticipate much resistance, but it suddenly dawns on you that it's New Year's Eve, and we all know how much the Beast loves his numbers... Architecturally and aesthetically the map's pretty bland, with a very symmetric circular layout in a techbase style. There's a raised, inner area with stairs leading downward in the cardinal directions, and an inner ring that facilitates access to the outer ring, an alternating series of roofed chambers and small, outdoor yards. Sverre Kvernmo's fifth Cabal map is, in keeping with most of his offerings, a deathmatch-oriented slobberknocker for MAP06 that's been re-purposed for single-player shenanigans. We Who are About to Die is dominated by the arena, an elliptical wooden enclosure with audience stands surrounded by a ring of flowing blood. There are four areas branching off in the cardinal directions in beige brick, each one with their own particular challenges. The majority of the action, of course, takes place in the center ring, which you will return to on several occasions throughout the course of its gameplay. Sverre Kvernmo's fourth entry in his Cabal series is actually the first WAD he ever created. He states that players need not worry about the WAD looking garish, and that's quite correct. Texture alignment is impeccable. Compared to the previous three Cabal maps, Temple of Death is quite large, and it clocks in at over 400 monsters. Depending on how things play out, you may end up having killed significantly more. My final count on my first run-through was 456. Besides its size, the main thing separating TODEATH from its brethren is its difficulty. The WAD hurts like nothing else for a variety of reasons, and while its encounters are all manageable, your average Doomer will get pummeled over and over by an exquisite series of dastardly traps that inflict untold amounts of pain. 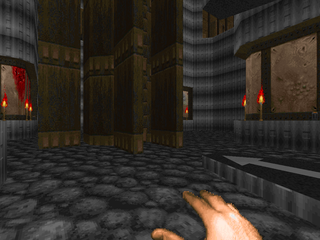 The Watchtower is the third map in Sverre Kvernmo's self-released Cabal series for Doom II, occupying the MAP04 slot. While both of the previous maps have an accompanying blurb describing their position in the overarching plot of Kvernmo's unreleased megaWAD, The Watchtower and the following map, Temple of Death, have no such niceties. The .TXT describes it as an attempt at a deathmatch level that got out of control, evolving beyond its original scope. Indeed, WATCHTWR is even more transparently a deathmatch level than Bloodflood. However, much like Bloodflood, the map's layout has been utilized for single player in a complementary fashion. 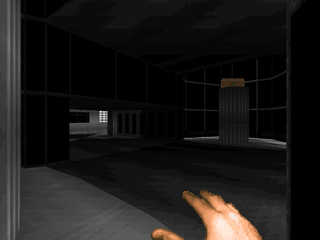 Derelict Station is another map from Kvernmo's Cabal series, broken up due to the inclusion of four others into id's Master Levels for Doom II. Playing the part of a Cyberdemon ousted from Hell after a coup by your own ruling Cabal (following a previous coup overthrowing Mephisto, who had failed in his invasion of Earth), you decide to take your revenge to them in your now human form. In Derelict Station, a MAP02 replacement, you've just escaped the Sea of Blood and clambered into a not-so-abandoned building for supplies, only to encounter some resistance. 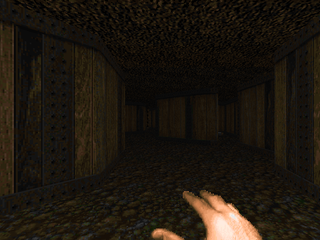 Sverre Kvernmo was a late addition to id's Master Levels for Doom II project. He sought out id and sent them a batch of maps for admission. All of his submissions came from a megaWAD he had been working on, where the player acts as a Cyberdemon cast out of Hell's ruling council, now seeking revenge. Four (well, five) maps made it into the Master Levels. The rest he uploaded to the idgames archive individually as Cabal 1-7. 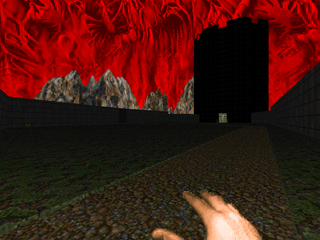 Bloodflood is contained in cabal1, though it occupies the MAP03 slot. As part of the Cabal series, it depicts the ousted Cyberdemon decimating one of the Cabal's blood depots, which helps to power their black magic rituals, and is apparently your first major blow against them.